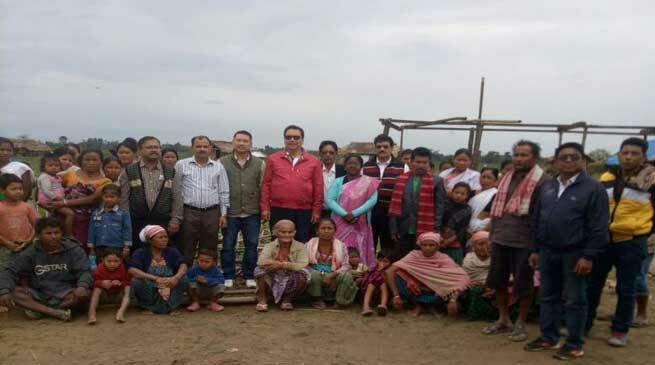 Deputy Chief Minister Chowna Mein on Tuesday visited rehabilitation camps in Lekang circle where 61 flood affected families has been shifted from the temporary relief camps by Namsai District Administration. Parliamentary Secretary (Forest & Environment) Chow Tewa Mein, Parliamentary Secretary (Planning, Personnel and Administrative reforms) Chau Zingnu Namchoom , Deputy Commissioner R.K. Sharma, EAC, Lekang S.Roy, EE, WRD J.Mannow, EE, PWD C.S.Namchoom and PRI members accompanied the Deputy Chief Minister . Expressing his satisfaction over proper settlement of the distressed people by the District administration, Deputy Chief Minister directed to provide all essential services to rehabilitation camps. Earlier, Mein inspected Noa- Dihing breach point at New Silatoo where major restoration work is going on. Stating his concern over slow progress of work he advised to ensure to complete the project before threat of monsoon. Later the DC had a meeting with the Executing Agency and contractor and directed them to take up the restoration work in war foot to complete the task by 30th April 2017.